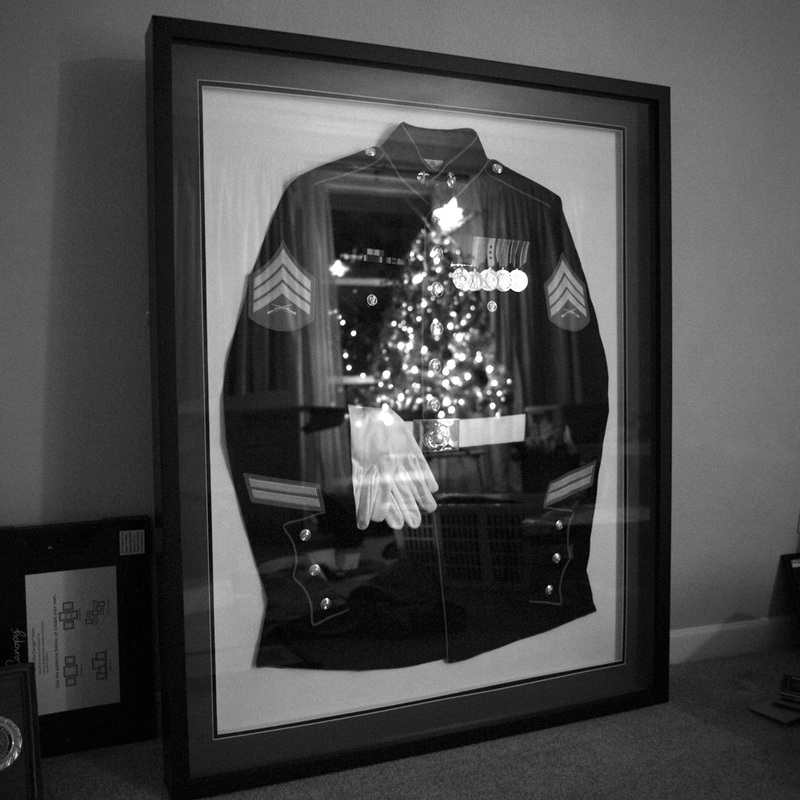 DALLAS, TX - DECEMBER 05: The lights of a Christmas Tree reflect in the framed uniform of twenty eight year old United States Marine Corps. Veteran, Ian Welch, at his home in Dallas, Texas, on Monday, December 5, 2011. Mr. Welch began his first day of boot camp on September 10, 2001, at age 18. He served three tours in Iraq as an infantry rifleman in the 3rd Battalion, 4th Marine Regiment between 2003 and 2005. During this time he was present for the taking of the Diyala Bridge in southeastern Baghdad and both Battles of Fallujah. During the battle for Diyala Bridge Mr. Welch was thrown by the blast of an enemy 155mm artillery shell causing a traumatic brain injury, that was diagnosed later in 2006. He was formally discharged in 2010 after serving his final two years in the Wounded Warrior Battalion in Camp Pendleton. Mr. Welch is considered 100% disabled due to his diagnosis of PTSD and TBI. In November 2011 he and his girlfriend, Katie Brickman, 23, moved from Willoughby, OH, to Dallas, TX, for the care of the Dallas VA Hospital. Ms. Brickman is Mr. Welch's caregiver, through the Department of Veterans Affairs Caregiver Support Program.